Today we have a two parter that to be honest is quite underwhelming. The city is dialling an Ancient “research base”, Asura, and sending a MALP through for initial recon. On the otherside they find what appears to be a colony of Ancients who survived the war. FART, along with Weir, step through after establishing contact with those on the otherside to find themselves in a much vaster but similar structure to the Atlantis Gate/control room that forms part of a great Ancient city centered around a city-ship. The group are brought before the High Council only to be met by their arrogant leader Oberoth who doesn’t seem to care for the plight of the Galaxy or dealing with the Wraith anytime soon, only claiming they have their own plans in motion. Leaving the meeting the team speak with their guide, another Asuran named Niam, is much more willing to interact with the team, very interested in their knowledge of ascension when questioned why they didn’t ascend like the rest of the Ancients. Eventually Weir meets with Oberoth again who is this time much more interested in where they came from when Weir asks for a trade for ZPMs from the Asurans but doesn’t agree to any terms. The team decide negotiations won’t go anywhere so attempt to leave, only to be captured by an Asuran detail led by Oberoth and taken into custody. While the team are put into a holding cell they don’t stay long, overpowering their captors when they deliver food. Escaping to a Jumper bay the team steal one of the ships before making it through the Gate and back home. After spending several hours waiting for anything to happen they find half a dozen Hive Ships have managed to sneak up on the city and open fire on it, with the first strike taking out the shields and cloak. The team begin the self-destruct and evac procedure back to Earth, with Sheppard staying behind to manually set off the bomb. Just as the bomb is about to go off however he finds himself back in a holding cell with Oberoth pulling his hand from his hand, revealing that the Asurans are Human-form Replicators and who’ve just gained the location of the city and its defences. The team find themselves locked in the cell as the Asuran city-ship takes off and heads for Atlantis. While Oberoth decides to have the team killed Niam instead helps the team understand what’s going on, with the Asurans wanting to destroy Atlantis in revenge for their attempt to wipe out the Asurans as a failed experiment thousands of years prior. Niam however decides to try and enlist the team’s help in rewriting their code to allow them to try for ascension in return for helping the Expedition to fight the Wraith. While working on the code Rodney programs in a “glitch” that’ll freeze the other Asurans for a few minutes and allow them to escape. The team go ahead with the escape, finding Niam isn’t frozen due to the changes made, and setup a ZPM overload to destroy the city after they escape. Seeing that Niam is different they decide to offer him the chance to come with them. As they make for the Jumpers however the Asurans begin recovering from the Glitch, barely escaping before they fully recover and before the ZPM overload destroys the city-ship. On the Jumper however Niam is remotely reverted back to a more aggressive state and attempts to kill Weir before the manage to lock him in the hold and vent him into space. As an episode Progeny is really a lesson in missed opportunities on the show. After a two year absence from the franchise the Replicators finally make a return to the franchise, this time having been developed in Pegasus by the Ancients many thousands of years ago. The problem sadly is that despite this reintroduction the show makes no attempt to really change the status quo or move the Replicators forward. The last form we saw in the Milky Way was the Human-form led horde, with the storyline having gone from a simplistic hivemind horde in seasons 3-4 and then slowly moving to them “evolving” to the Human-forms over the following years. Here however we’re presented with them in this final form as it were but they don’t really change the game. It’s the same old head torture trick and the aim to destroy all organic life as they see themselves as superior to their creators. It seems as though the show decided to play it very safe by not changing them across the transition between the two shows in case of new viewers not having seen the SG-1 version but given how they’re namechecked again and again it seems to be the wrong choice as the lack of expansion means they’re not the threat they were previously other than the fact there’s lots of them. The two real named characters amongst them, Oberoth and Niam, also sadly seem to be little more than rehashed from First and Fifth on the original show, with Oberoth just as manipulative and arrogant as First while Niam is the more initially sympathetic Fifth (you know, before he went all restraining order) with him wanting to work with the humans and look for a more peaceful path in life. Again it seems to have been a decision to play it safe, all the way down to Niam becoming an innocent victim of events. The only real change though is that instead of it being the team betraying someone, which was a real courageous leap by the writers on SG-1, it’s his own kind who betray him thereby exonerating the team from all responsibility and being even safer and blander as a result. One of the changes the episode does make though is have this version of the Replicators less of a mystery and also put onus on the Ancients for screwing up. With Reese and the SG-1 Replicators the fault was clearly on Reese’s side (if somewhat due to immaturity than vindictiveness) as she created the Replicators that ended up wiping out her whole race and likely countless others. Here however the blame falls squarely on the Ancients for having deliberately created them as a weapon and then failed to properly clean up their mess, similar to how armies have left landmines in the field after many wars. All it took was the team stumbling once again onto information the Ancients just left lying around for things to go sideways big time. Once again it shows that one of the main strengths of both SG-1 seasons 9-10 and Atlantis as a whole has been the deconstruction of the earlier belief that the Ancients were all-knowing and loving gods. In the end the episode stumbles sadly in its reintroduction of the Replicators as while it makes the origin unique and different to what came before the actual status and abilities of them is still very much how it was left off by SG-1 all those years ago. · You’d think the team would’ve learnt that telling new people everything about themselves usually goes wrong. · Really, the Ancients extermination policy was “launch a bunch of missiles and hope it works”? · Wow look how not frozen those Asuran extras are. We open with Weir waking up in hospital back on Earth and finding her room locked. Upon pounding on the door a Dr Fletcher arrives to reveal that she’s in a psychiatric hospital outside D.C. Weir questions just when she returned to Earth from Atlantis only to be told that she’d never left Earth. The doctor claims that she’d been in a coma ever since a collapse a few days ago and that “Atlantis” must be a dream of hers. Refusing to believe the situation Weir demands to speak with O’Neill who claims that there’s no such thing as the “Stargate Program” or anything to do with it and that they only worked together on a weapons proliferation treaty. While talking to him Weir notices something’s off when O’Neill head suddenly goes all dolalee. Weir attempts to escape only to be restrained by the guards and sedated. Upon waking Dr Fletcher reveals that her mental break is likely due to the death of her partner Simon, who’d perished in a car crash. In an attempt to help her reintegrate Fletcher has Weir meet with her mother in the grounds of the hospital, who also brings her items she had in Atlantis. That night Weir has visions of someone watching her from behind a sheet. Despite the continued reassurances of the medical staff Weir refuses to believe that Atlantis isn’t real and spits out her medication. Weir eventually moves out of the hospital and tries to get back to normal, with O’Neill visiting to offer her old position at the UN back. 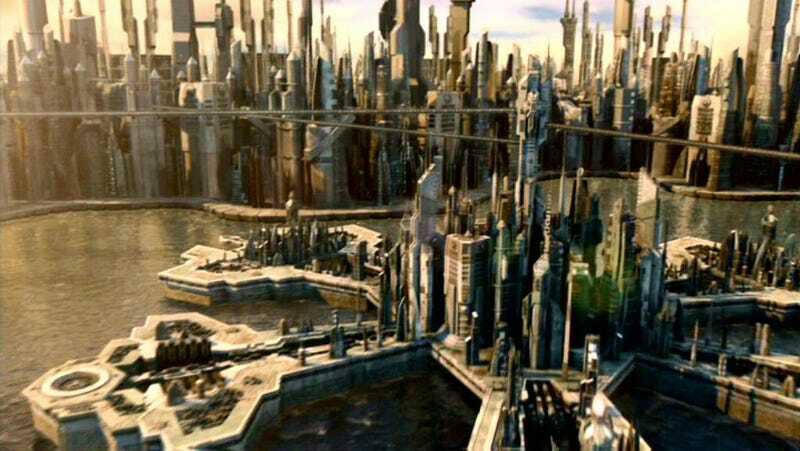 As she sleeps that night however it’s revealed Atlantis is real and that Weir is in a coma due to Replicator nanites infesting her, with the team having no way to help her. Inside her coma Weir begins to hear Sheppard calling out for her, causing a “relapse” and seeing her sent back to the hospital. Outside in the “real world” the team manage to work out a way to remove the nanites from her body by using Wraith tissue as a distraction for the nanites to attack and then hit them with an EMP to wipe them out. While it’s mostly successful a few nanites survive, preventing her from waking up but also allowing her greater control over the coma dream. Weir is able to escape the hospital in an elevator, finding herself back in the SGC from where she is able to make it to the Gate and escape the nightmare. In contrast to what felt like wasted opportunities with the first part of these two episodes this one feels like it started off well but then became overstuffed towards the end by the writers. What could’ve been a simple “is this real” shock plot became a bloated mess. The real crux of this problem is the Atlantis focused part of the episode. While parts of it weren’t perfect this was the first real Weir-centric episode and the parts of the episode dedicated to that are the best in terms of the flow of the episode. When it strays to Sheppard and co doing techno-babble outside the isolation room it starts to go downhill fast, with the whole thing being some battle of wills regarding nanite takeover. While the show has down the “battle of wills” item before with Teal’c which involved two running plotlines that felt far more spiritual in nature and the outsiders had no ability to interact with what was going on with the subject. Here however the outside world begins to interfere with Weir’s process, making it less about her as a person. Outside of this the Weir subplot was rather good I thought, with a strong focus on her willingness to succeed along with some snippets of backstory that hadn’t really been hinted at before. To some degree again though it was flawed, with O’Neill’s cameo feeling slightly out of place given the episode. It was strange for the previous leading man to suddenly be the villain of the piece while others were left alone and was slightly too jarring a change, especially given how we already knew he had no part of her previous career at the UN. Maybe this was meant to hint that this was obviously a false reality but if that was meant to be obvious while Weir didn’t notice it then it seemed a bit of a damp squib. Overall the episode was an attempt to do a Weir-centric episode that was sadly squandered by stuffing it with sideplots that weren’t really needed and detracted from the character focus while also including an out of place cameo that could’ve been saved for a better occasion. · What if this is all a lie inside the woman who sees Neptunians and her “invaders” are real! · Why did they have “dream Sheppard” played by someone who obviously wasn’t Sheppard?